Yes, they're really that good - L'As du Fallafel in the Marais! L'As du Fallafel's overstuffed falafel sandwich is like an explosion of flavors and textures in your mouth. Crunchy, smooth, slightly spicy, all delicious! MK: Do you like falafels? Cuz if you do, we should go to L'As du Fallafel while we're in the Marais. Visitor: Yeah, I like falafels...but I can get pretty good ones in (insert name of city). MK: Well, these are supposed to be the "world's best". Visitor (intrigued but doubtful): Are they really that good? MK: Let's go and you can tell me what you think. Visitor: Why are all of those people standing in line? MK: That's the falafel place. Visitor: Are they really that good? I mean, is it really worth the wait (eyes glance over to the falafel place across the street without a line). MK: They're the best I've ever had. Visitor (still skeptical as (s)he glances around the restaurant): Well, everything looks alright. Our food arrives and visitor takes a bite. Visitor: (talking around a mouth stuffed full of food) Mmm, they're delicious. I can't believe how good this is! It's the best falafel sandwich I've ever had!!! MK: (completely quiet because I'm too busy savoring each and every bite). During a recent Jewish History Tour of the Marais with Sight Seekers Delight, I learned that L'As de Fallafel sells 6-700 falafels per day at their takeout window. That total doesn't seem to include the number sold in their restaurant. It's no wonder that they're so darned good - everything is freshly made. For the uninitiated, falafels are chickpea fritters fried to a lovely shade of crispy brown. Sandwiches are made with fluffy pita bread, hummus, fried eggplant, sliced cucumbers, pickled red cabbage, tomatoes and a creamy sauce. And to make things even better - the restroom at L'As du Fallafel is one of the cleanest I've seen in Paris. L'As de Falafal is so memorable that it served as the inspiration for the chickpea fritter sandwich at Clover Food trucks in Boston. Having lived in Israel and as a big fan of all foods Middle Eastern, will save my opinion until I get there. But, your photgraphs surely make them a serious contender for "World's Best". The toppings and t'china really make the difference. Do they have also have schwarma?....Israeli owned? Would be alot easier for me to converse with them in Hebrew than with my 10 word French vocab. LOL! You sound exactly like my visitors, Nancy! You'll have to try one when you're here in April and let me know what you think. The owners are Jewish (I don't know about Israeli) and they speak Hebrew. I was the sole goy (?) on the Jewish History tour and everyone else was raving about L'As de Fallafel. I went there with a widely traveled couple from Miami and they said that they've always found these falafels to be the best. Yes, they have schwarma (see last photo). That's what Stephane always takes. Sara, have you tried Rami's in Coolidge Corner? It's on Harvard Street and was great ... but that was at least a dozen yrs ago. There used to be a place called Mi Va Mi (not the one in le Marais! )but I thin it's gone now. That was in the '90's. Thanks, Nancy! I haven't tried Rami's but will definitely have to check it out! I went to a great Jewish delicatessen in Coolidge Corner at one point but haven't tried any other places in that area - this'll give me a great reason to go back! Thanks for all of tips for Boston, Nancy! I'll try some of these places the next time that I'm there. I LOVE Mediterranean food! Mmm, those photos are mouth-watering! Unfortunately, I have yet to try it because they were closed on the day I was in the Marais, so I chose Chez Marianne as my plan b. Will definitely give them a try next time. Sorry to hear that you missed them when you were here. That has happened to me a couple of times - I'll go to the Marais with the sole intent of getting a falafel only to discover that they're closed. Come to think of it, I should put the opening hours in the post. Thanks for the reminder! Yum. that's all I have to say. except, that line--oh man, I'd have to pay someone to wait in it for me. of course, they should buy the place across the street and just open a second location. Aww, Joseph - standing in line is part of the experience. I've actually been disappointed when there isn't one. I usually eat in the restaurant and the line isn't as long as the one for the takeout window. Mmm yummy! I keep meaning to go there and Angelica's, unfortunately I'm next in Paris on a Saturday, so no dice! Oh, well - you definitely won't go hungry because there are so many yummy things to eat. Angelicas (?) or Angelina's for hot chocolate? There's always a line for Angelina's on rue de Rivoli although I'm not inclined to stand in it. While their hot chocolate is undeniably delicious, it's the only place where I really didn't like the way that I was treated. While the setting isn't as nice, there's also an Angelina's in Galeries Lafayette that isn't as crowded. It's the same hot chocolate with less stress. But I normally go to Jean-Paul Hevin's for hot chocolate. It's not as thick as Angelina and there isn't whipped cream, but they have different flavors. I'll write a post about it. Ah, yes I meant Angelina's. I have my doubts that it will be as good as hot chocolate I've had in Eastern Europe/Russia, where it's so thick you can stand a spoon up in it and tastes like a melted chocolate pudding. But one can always find out! That's a good tip on going to the Galeries Lafayette branch or Jean-Paul Hevin's - I don't like whipped cream anyway. If you're looking for really thick hot chocolate, the thickest that I've had was at Amorino's. I even compared it to pudding when I was "drinking" it. In order of thickness, it would be - Amorino, Angelina, Jean-Paul Hevin. 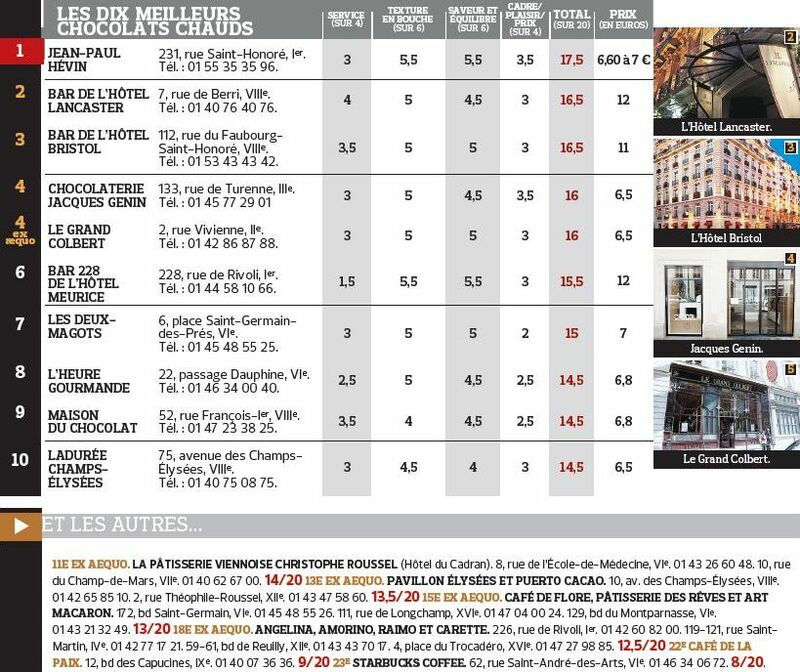 Here's the link for le FIgaro's ranking of hot chocolate in Paris. It reminds me that I still have some serious taste testing to do while it's still cold enough to enjoy hot chocolate! That is some serious hot chocolate -- I've never seen any that thick in Paris! Put a dab of whip cream on top and I'd be in hot chocolate heaven! Thanks for sharing the link. Mary Kary I'm looking at renting an apartment the next time we're in Paris; would you recommend staying in the Marais district? Last time we stayed in the Montorgueil neighborhood, but all places in that area are booked. And for the record you're a "shiksa" and you've got "shiksa-appeal" =) one of my favorite Seinfeld episodes. I didn't want to correct Mary Kay on the "Goy" label being masculine...but happy that someone else had enough "chutzpah" to notice and post. Chickster, As Nancy says, thanks for having the "chutzpah" to tell me that I'm a "shiksa" and not a "goy". It will save me from future embarrassment! I'm going to see if I can download that Seinfeld episode on itunes. It sounds like one that I have to watch! As for the apartment, I love the Marais and would happily stay there. 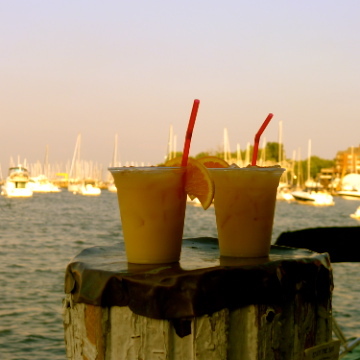 It's conveniently located and has lots of good restaurants, nightlife and shops. That's where Mlle Ella lives so she knows more about that area of Paris than me. Nancy, As the youngest of 5 children and having lived most of my life in countries where I'm not fluent in the language, I'm used to being corrected....all of the time. :) When I'm talking about non-Jews in the plural, would it be correct to say "goyem" if the group is made up of both men and women? Oooooh yeah, they are THAT good. My friend Thomas took me here during the crux of my break-up and it helped! Miamsville! I can see how a falafel would help mend a broken heart! Thomas is the kind of friend that every girl in distress needs. Hero Husband and I took a walking tour through le Marais some weeks ago and I wondered (for a while) what that huge number of people standing about were doing in the street. Coming closer to l'As du Fallafel, I knew... :))) It was a really truly amazing sight - at least 30 people lining up just like in UK, talking and laughing, waiting patiently until their turn was up. We 'earmarked' the place too for a meal in the future. Love fallafel - and when they are particularly good as they look on your photos, I can hardly wait to go back and get in line!!!! Mmmm, homemade plum tarts are delicious and definitely on a par with a falafel! I hadn't thought about it until reading your comment, but it's true that everyone lines up very patiently at l"As...just like in the UK and not like in Paris! The line to the left of the door is for the takeout window and the line to the right is for the restaurant. The falafels cost a bit more inside but the wait isn't as long. If you can, try to time your visit at an off-time and then there may not be a line at all.